May was a great month for translators and interpreters! On May 24, the United Nations adopted Resolution A/71/L.68, making September 30th International Translation Day. This historic resolution acknowledges the crucial contribution language professionals make to the United Nations. International Translation Day is already being celebrated each year on September 30, but the UN’s formal establishment of this day raises additional awareness about the important role translators and interpreters play in connecting nations and fostering peace, understanding, and development around the world. 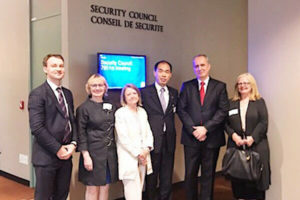 Left to Right: Ruslan Varankov, Counsellor/Legal Advisor to the Permanent Mission of the Republic of Belarus to the United Nations, Vigdis Eriksen, chair of Red T, Linda Fitchett, chair of the conflict zone interpreter group of the International Association of Conference Interpreters, Henry Liu, president of the International Federation of Translators, Ambassador Andrei Dapkiunas, Permanent Representative of Belarus to the United Nations, and Maya Hess, founder and CEO of Red T.
The following day, May 25, the United Nations Security Council debated on the topic of protecting civilians in conflict zones. H.E. Andrei Dapkiunas, Ambassador of Belarus to the United Nations, spoke up for translators and interpreters who work in high-risk settings. In his remarks, he asked the Council to consider translators and interpreters as a category of individuals who deserve special protection. Linguists translate for journalists and the armed forces in conflict zones, assist organizations that deliver humanitarian aid, help ensure due process and justice in the courtroom, and aid peace negotiations. In doing so, they place their lives at risk and many of them are threatened, persecuted, prosecuted, incarcerated, kidnapped, and killed. Red T has long been fighting for the protection of translators and interpreters in conflict zones and other adversarial settings. Together with the five major international language associations (AIIC, FIT, IAPTI, CLI and WASLI), the non-profit has been advocating for a UN resolution that will grant translators and interpreters specific protection under international law, and mandate that member states prosecute crimes perpetrated against them. At Eriksen, we are proud to support Red T’s mission to establish translators and interpreters as a global, impartial, and protected community.